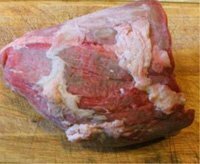 Here you can find pictures and description of the following beef meat cuts: filetto, scamone or polpa, lombata, fiorentina, girello or magatello, fesa, noce, pesce, geretto posteriore. You can find also images where the cut is located. 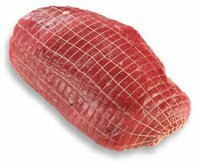 Italian forst class beef meat cuts are used for the most known recipes for beef and veal meat of italian cooking, and also for salamis like bresaola and carne salada. very appreciated cut it is more known as roast-beef. Soft and tasty it doesn't require long cooking time, it is than good for quick meals. It is ideal for eating raw with fillet in the "tartare". perhaps the most expensive cut. Very soft requires quick cooking. perfect for the mixed boiled meats, even if very lean, it is ideally for stewed and braised. cold veal with tuna sauce, boiled meats, roasted, but also escalope and veal rolls. Good for "carpaccio". 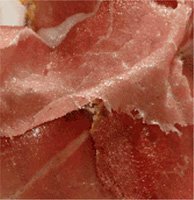 The bresaola is the typical salami from the Valtellina, the valley on the border with Switzerland, that obtained the IGP from the EU. Proofs of the production of this salami are dated 1650. The etymology can be connected to the Germanic word "Brasa", meaning brazier. In the ancient time for making the rooms dry and keep the temperature constant people used braziers, where they burned pine wood aromatizing the smoke with juniper and laurel. 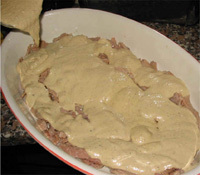 It is produced utilising the "magatello" and the "punta d'anca" ( an other name for the scamone) of the adult beef; the meat at first is salted , spiced and with pepper added. Then put into sausage skins and seasoned. 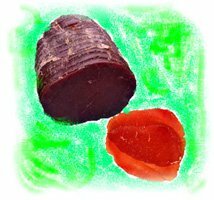 The result is that bresaola has few fat, but a good quantity of iron and protein, and also salts. It is then suitable for IPO caloric diets, but inadvisable for elderly and hypertensive people. 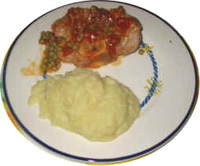 it is the classic for veal escalope and veal rolls. 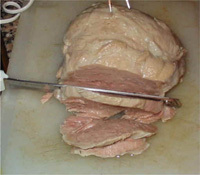 It is a very old recipe born for maintaining the meat for long time. In the Trentino area was it was usually the process of smoking. 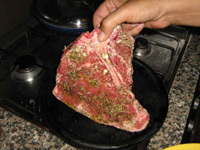 The beef meat, generally the fesa of manzo, cleansed and cut to compact pieces weighing about 4 or 8 lbs (1 or 2 kg) is put into a particular earthenware pot called Pitàr and brined with spices, black pepper, garlic, rosemary, laurel, sage and juniper added. 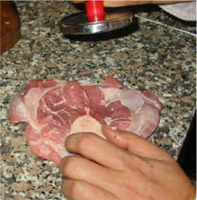 During this time the meat must be turned upside down every day, paying attention to put on the upper part the parts situated on the bottom and adding, if necessary, aromatic white wine, for avoiding it to dry. The conservation is made in a fresh place and with constant temperature at no more of F 42-46 (C 6-8). This meat is eaten sliced to very thin slices, either rough or cooked, combined in this case with borlotti beans, extra virgin olive oil of the lake of Garda and onion finely sliced. excellent roasted and boiled. Good for the veal in tuna sauce. one of the most flexible parts. Practically suitable for every cooking. la little tougher than the "noce", but very good for boiled meats and roasted. like the foreshank, but with more flavor. Good for preparing "ossi buchi"